Abrupt climate change is a potential menace that hasn't received much attention. That's about to change. Through its Climate Change Prediction Program, the U.S. Department of Energy's Office of Biological and Environmental Research (OBER) recently launched IMPACTS – Investigation of the Magnitudes and Probabilities of Abrupt Climate Transitions – a program led by William Collins of Berkeley Lab's Earth Sciences Division (ESD) that brings together six national laboratories to attack the problem of abrupt climate change, or ACC. Sparked by the 2007 Nobel Peace Prize shared by former vice president Al Gore and the Intergovernmental Panel on Climate Change (IPCC), the reality of global warming finally got through to the majority of the world's population. Most people think of climate change as something that occurs only gradually, however, with average temperature changing two or three degrees Celsius over a century or more; this is the rate at which 'forcing' mechanisms operate, such as the accumulation of carbon dioxide in the atmosphere due to the burning of fossil fuels or widespread changes in land use. But climate change has occurred with frightening rapidity in the past and will almost certainly do so again. Perhaps the most famous example is the reverse hiccup in a warming trend that began 15,000 years ago and eventually ended the last ice age. Roughly 2,000 years after it started, the warming trend suddenly reversed, and temperatures fell back to near-glacial conditions; Earth stayed cold for over a thousand years, a period called the Younger Dryas (named for an alpine wildflower). Then warming resumed so abruptly that global temperatures shot up 10 °C in just 10 years. Because civilizations hadn't yet emerged, complex human societies escaped this particular roller-coaster ride. Nevertheless, some form of abrupt climate change is highly likely in the future, with wide-ranging economic and social effects. Collins, who heads the Climate Science Department in ESD, is the principal investigator for IMPACTS, which will bring together the work of experts in physical, chemical, and biogeochemical climate processes and in computer simulations of the whole Earth system. Argonne, Los Alamos, Lawrence Berkeley, Lawrence Livermore, Oak Ridge, and Pacific Northwest are the participating national laboratories. "IMPACTS is one part of a two-pronged approach to studying abrupt climate change, one based in the universities and the other in the national labs," says Collins. "Both elements will share a central web-based portal, with all the participants meeting annually." The goal is to understand possible mechanisms of abrupt climate change well enough to build comprehensive computer models, Collins says, and to make accurate predictions before abrupt climate change strikes again. 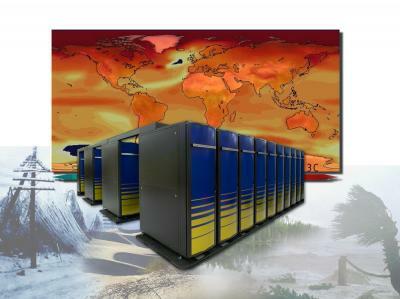 Collins coordinated the development of the most recent version of the Community Climate System Model (CCSM), one of the leading models underpinning the physical science basis of the IPCC's 2007 climate change assessment; the IMPACTS program will be based on CCSM and will add new capabilities and new diagnostics for processes that could initiate abrupt climate change. CCSM, called by Science magazine "the nation's foremost academic global climate model," has long been supported by both DOE and the National Science Foundation. "There are lots of names for abrupt climate change: nasty surprises, the jokers in the deck, the tipping point," Collins says. "When the national lab participants first met to decide on the most significant potential sources of abrupt climate change in future, the first thing we had to do was define what we meant: a large-scale change that happens more quickly than that brought on by forcing mechanisms – on a scale of years to decades, not centuries – and that persists for a very long time." Only half joking, Collins refers to these as "the Four Horsemen of the Apocalypse." Marine ice sheet instability: marine ice sheets flow from the land into the sea and are partly grounded below sea level, extending across the ocean surface as floating ice shelves. Greenland and the West Antarctic ice sheets are already losing mass at an accelerating rate, with the primary cause apparently the warming of the oceans, not the air, through melting of ice buttresses below the water's surface. Topographical and other features make the West Antarctic ice sheet particularly vulnerable. For 40 years earth scientists have worried about what would happen if global warming eventually caused the West Antarctic ice sheet, some 3.8 million cubic kilometers of ice, to break up and slide into the ocean. 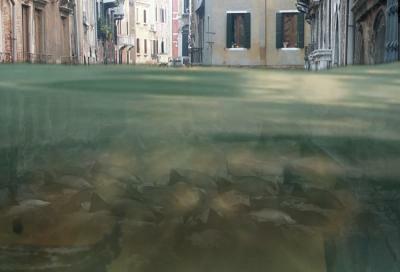 Sea level would rise four to six meters – 13 to 20 feet. Port facilities worldwide would be submerged; atolls and island chains would vanish; parts of Bangladesh, Brazil, Burma, America's Gulf States, and other low-lying areas would flood; Venice, New Orleans, and many other cities would sink. It's now apparent that these events may not be "eventual" – abrupt climate change could cause rapid melting and the subsequent rise of sea level not by centimeters but by meters per century. Under the direction of Bill Lipscomb of Los Alamos National Laboratory, IMPACTS researchers including Rob Jacob from Argonne National Laboratory will undertake the difficult task of realistically modeling the processes of ice-shelf melting, the retreat of a shelf's underwater grounding line, and the calving of icebergs. Concentrating on the West Antarctica ice sheet, they will use the Hybrid Parallel Ocean Program (HYPOP) developed at Los Alamos and other programs to simulate ocean currents beneath ice shelves up to hundreds of meters thick and hundreds of kilometers in extent; to model the exchange of heat between ocean and ice; to model the shifting grounding lines of the ice shelves; and to model the changing shore lines of the world's oceans as the ice shelves evolve. The goal is to assess the likelihood of abrupt ice-sheet retreat under different conditions and to incorporate the regional ice-sheet model into the fully coupled CCSM global model. Positive feedbacks in boreal and Arctic ecosystems: more than a third of Earth's terrestrial organic carbon is concentrated in the ecosystems north of the 45th parallel, much of it in soil, peatland basins, and permafrost. Positive feedback within ecosystems and among terrestrial ecosystems, climate, and ocean currents could rapidly release much of this stored carbon into the atmosphere. Higher air temperatures and increased precipitation have already reduced snow cover and increased runoff from melting permafrost; vegetation types have started to shift, affecting, for example, how much sunlight reaches the soil or is intercepted by forest canopies. Less snow cover means less reflectivity (albedo); dark soil and trees absorb more heat from the sun. The kind of permafrost called yedoma is particularly rich in carbon, an important substrate for methane formation. Methane, a greenhouse gas 26 times more powerful than carbon dioxide in the short term, is released when the permafrost melts. Even ordinary soil will exchange more carbon with the atmosphere as it warms and wets. In addition, as more fresh water flows into the Arctic, changes in salinity could alter the exchange of water with the North Atlantic and shut off ocean currents that keep Europe warm in winter. Northern Europe may grow colder even as the oceans' ability to absorb carbon dioxide decreases and the planet as a whole grows warmer, faster. Positive feedback involving ice-melt has already accelerated the pace of global warming in the far north. It now seems likely that changes in terrestrial ecosystems, which could occur over only 20-30 years, may amplify currently predicted global warming by two or three times, in the Arctic and possibly globally. Led by Collins, IMPACTS researchers including ESD's William Riley and Margaret Torn, plus Mac Post from Oak Ridge National Lab and Qianlai Zhuang from Purdue University, will add significant new capabilities to the Community Land Model (CLM) component of CCSM. Their goal is to produce dramatically improved predictions of abrupt climate change resulting from positive feedbacks between the climate and ecosystems of the boreal and Arctic region. Methane hydrate destabilization: a vast quantity of carbon – possibly more than all the recoverable fossil fuels on Earth – is trapped in frozen methane hydrates under the oceans. Methane gas molecules are locked inside cages of water ice in a form so concentrated that when the ice melts the gas expands to 164 times its frozen volume. Over time this methane, if released into the atmosphere, would be up to 72 times more potent than carbon dioxide as a greenhouse gas. During a thermal maximum 55 million years ago, which marked the boundary between the Paleocene and Eocene epochs, the planet warmed rapidly by five to eight °C; the pattern of deep-sea extinctions and spikes in methane concentrations in the fossil record during this 20,000-year period point to methane release as a possible cause. High pressure and low temperature insure that most deep-water methane hydrate deposits would be stable even with considerable warming of the atmosphere. But in the Arctic, methane hydrate deposits exist near the edge of the safe temperature-pressure zone; in these locales, methane release could be abrupt. The resultant rapid warming would trigger yet more releases of methane: permafrost would melt, the deep sea would become a dead zone, the hole in the Arctic ozone would grow bigger and occur more frequently. IMPACTS researchers, led by Philip Cameron-Smith of Lawrence Livermore National Laboratory and including ESD's Matthew Reagan and Scott Elliot and Mathew Maltrud of Los Alamos, will study a range of rapid-change scenarios by coupling a number of proven models: Berkeley Lab's TOUGH+HYDRATE code has been successfully used by oil companies and geologists to model subsurface hydrate dissociation and gas production, and Los Alamos's Parallel Ocean Program (POP) and Lawrence Livermore's Community Atmosphere Model (CAM) are already components of CCSM. By accommodating improved methane dynamics in climate and ocean models and studying coupled methane-hydrate dissociation and transport at the seafloor, the researchers hope to make accurate assessments of methane releases and the consequences for oceanic and atmospheric chemistry. Megadroughts in North America: "ordinary" greenhouse warming as forecast by the IPCC will result in warmer and dryer conditions in the subtropics, including Mexico and the southwestern U.S. More than warming of the air and sea surface are involved. Storm tracks are likely to shift north, and the jet stream will probably stabilize in a new configuration. Dried-out soil and hot, dry atmosphere could interact to start abrupt climate change. Conditions as severe as the Dust Bowl of the 1930s will return and could persist for decades: a megadrought. Until seven or eight hundred years ago, Central North America seems to have been characterized by much longer and more severe droughts than at present. The Dust Bowl of the thirties turned many once productive fields and rangelands into shifting sand dunes; the past was even worse, with vast sheets of sand on the move all across the High Plains. IMPACTS researchers, led by Ruby Leung of Pacific Northwest National Laboratory and including Celine Bonfils and Thomas Phillips of Lawrence Livermore, will test two hypotheses. The first is that plants modulate soil hydration in the early stages of a drought by redistributing deep ground water through their roots and leaves. But when the water table drops too low, plants accelerate the desiccation of the soil surface by their one-way transpiration of moisture into the atmosphere. The second hypothesis is that dust storms will alter the North American monsoon, which brings water from the Gulf of Mexico and the Gulf of California during the summer months to contribute one-half to two-thirds of the annual precipitation in the Southwest. Complex interactions of surface conditions, atmospheric stability, dust-particle aerosols, and other factors could profoundly alter monsoon circulation in unpredictable ways. To predict now-unpredictable megadroughts, researchers will improve global and regional climate models, including the Weather Research and Forecasting (WRF) model developed at the National Center for Atmospheric Research and other agencies, coupled with the Variable Infiltration Capacity (VIC) model of water-energy exchange developed at the University of Washington, as well as land surface and plant models. "IMPACTS starts by using primary scientific research to build detailed models of processes that have been included only roughly, if at all, in climate models – the effects of methane on sunlight, for example, which has never before been incorporated, or the role of vegetation in moisture exchange between soil and atmosphere," Collins says. "We will use our improved models to help build an even more powerful CCSM, one we hope will be able to make very robust predictions." "Suppose we see something," says Collins. "Suppose, for example, our models predict the abrupt onset of a megadrought in the Southwest." The first step will be to assess the prediction by measuring it against the past. "We go back in time. If the conditions we think will lead to abrupt climate change would not have produced this result in the past, we still have work to do. On the other hand, if our models can use data from past conditions to recover what actually did happen, it's an excellent test." A believable ACC prediction would mean "we are facing the largest imaginable negative impacts on human civilization, conditions that will take society outside all normal modes of adaptation very quickly," says Collins. "The consequences will be especially dire for resource-limited populations. This is a huge threat to the security and stability of our nation and the world, which is one reason DOE has made a major investment in CCSM." Collins says that the 30-year quest to make climate models truly comprehensive has only recently met with success. "We used to build in the carbon cycle by telling the model how it would work – but we've learned that we can't assume that; the carbon cycle is extremely sensitive to even relatively small changes in temperature and rainfall. We've only recently been able to simulate vegetation; we used to model forests by just placing them into the model arbitrarily – now we allow them to grow themselves. Much of this is possible because of DOE's huge contribution to climate modeling through supercomputers. That's why Berkeley Lab's NERSC" – the National Energy Research Scientific Computing Center – "is such an important part of our IMPACTS partnership." One of the great benefits of IMPACTS, in Collins's view, will be to bring together parts of the climate community whose communication has traditionally been poor. For scientists concerned with the effects of climate change and those concerned with modeling it, "the working relationship hasn't been there," says Collins. "For example, of the major threats to human health from global warming, the worst is malnutrition – but the second worst is extreme weather!" Collins says that modelers now have the ability to take lessons from likely impacts back into their basic research. "Modeling a specific region with a specific set of circumstances in high resolution and making a solid prediction of what's going to happen in the next few decades is much tougher than modeling what's going to happen to the whole globe a century from now," he says. "Those concerned with the effects of climate change on humans have never asked modelers to do this before. We hope that IMPACTS will demonstrate that it can be done."